Which is not Tomb Enough and Continent to Hide the Slain? I lunch with Jonathan and Renee, who are here for the Graduation Ceremony. Next I go for a ramble down by the sea in front of where I live. It is a truly wonderful day, bright sunny and not too hot. 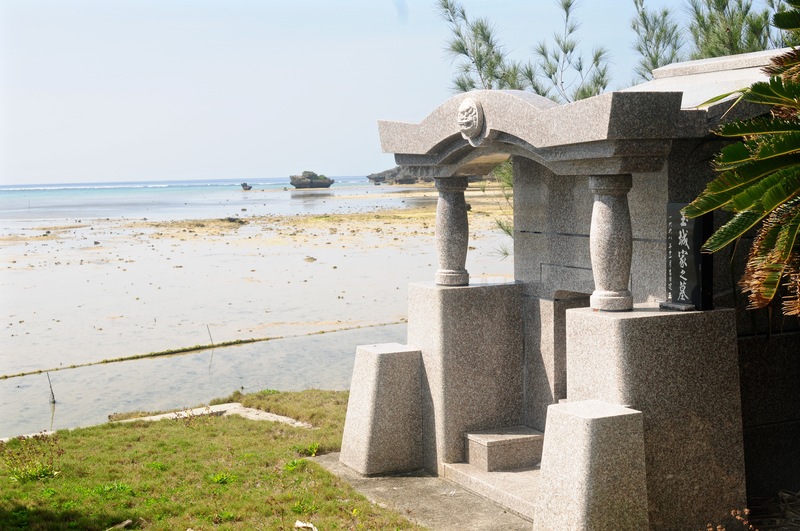 Okinawa has a strong ancestor worship tradition and families have their individual tombs. 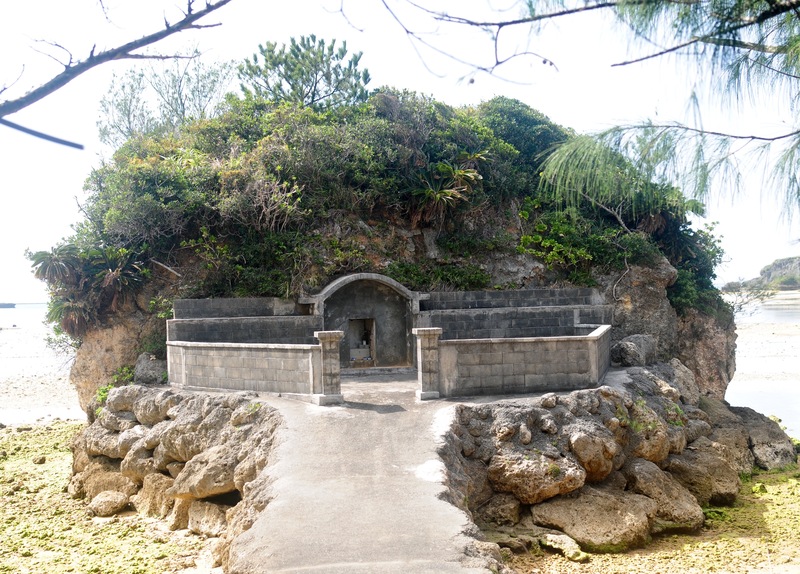 The area in which I live is tomb rich. Low tide unfortunately. This islet is normal set in a silver – actually turquoise – sea. This is just in front of my apartment. These I believe to be very old and I think abandoned. Anyway enough of this soft stuff. Yesterday I had a long talk with Sato san. He is a wonderful man who has spent many years setting up rigging for racing yachts and is held in great respect around the boatyard. He is also a stern taskmaster. He insists that I take off all the ancient sealant that is stuck to the underside of the gunwhale trim and varnish. 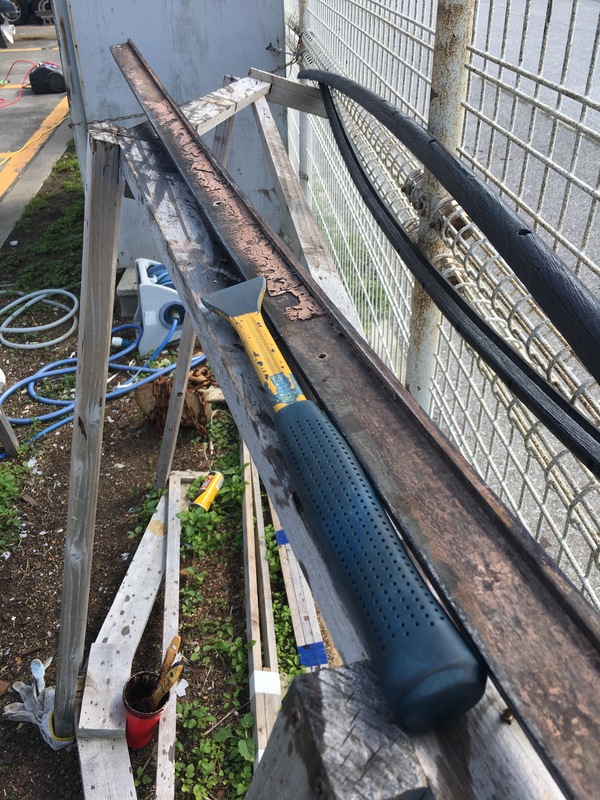 This turns out to be very difficult as the ancient sealant, sometimes very thick, is fast to the wood and my little scraper has not much effect. Sato san then produces a real scraper. It smashes off all the residual sealant in no time at all. 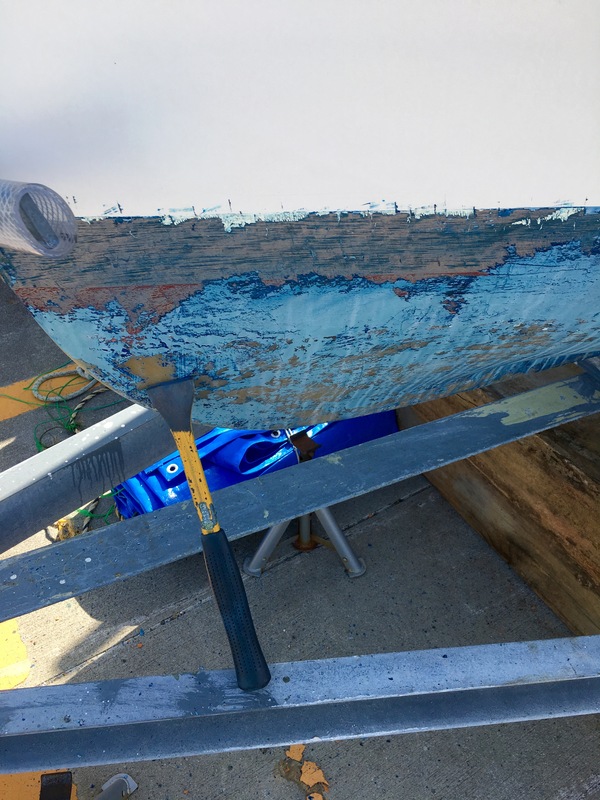 I then ask him about removing the old antifouling paint. Again he says use the scraper. The right tool for the job. Sato san lends it to me and seems deeply unconcerned about getting it back. This is very Okinawan. 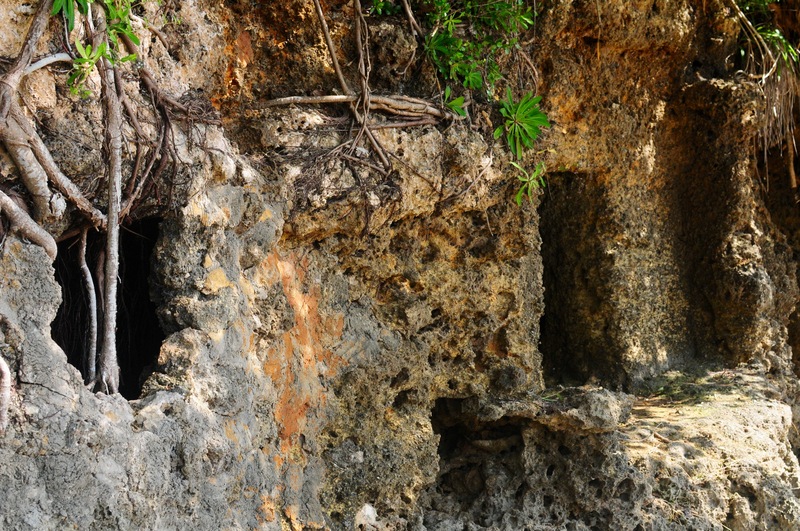 2 Responses to Which is not Tomb Enough and Continent to Hide the Slain? 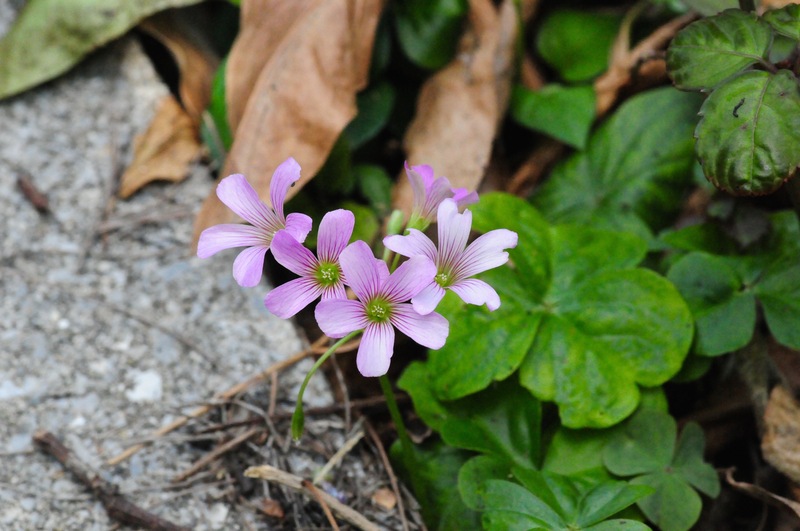 The little pink flower looks like an oxalis, possibly Oxalis Corymbosa which is a native of South America, but is now naturalised in Japan. 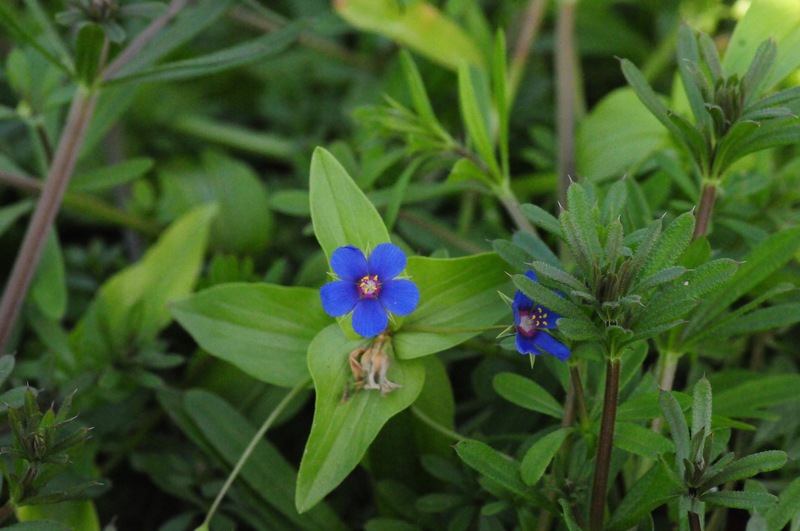 The blue one has leaves like a bulbous plant but I cannot identify it.